So you have been practicing your Photoshop skills and want a new project? 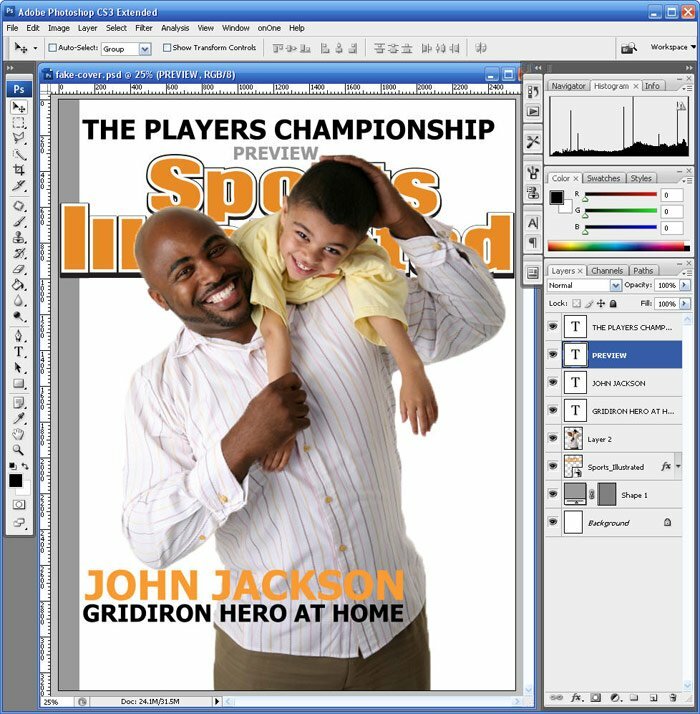 Try creating a fake magazine cover as a personalized gift! It’s a cool idea that will make a real impact. The SI cover is my model for the gift. This one says “father”, but you could easily pick a cover that works for that special gift (swim suit edition, golfer, baseball player, etc.) I found the blue SI logo on the web, imported it into Illustrator and modified it to get close. The logo does not have to be exact; just close enough so that the recipient will make the connection. 2. Start your layout matching the colors and style – remember you are trying to make the connection to the real magazine. A person who reads the magazine every week or month can easily recognize it on the newsstand. By matching the layout style and colors, you can easily make that same connection (even if you have never read the magazine.) I used Tahoma font for the headlines (similar but not exact) and just matched the colors. Be sure to use the recipient’s name in your layout!! 3. Finish it off – there are several ways to deliver the gift. You could just save a JPG and email it (great for someone far away or deployed overseas). A traditional gift would be to printing it and framing it, either on your own photo printer or through Mpix. But, there is also micro-printers like Zazzle to put the completed image on a T-shirt, mug, mousepad or button. Now that’s a personal gift! well i prefer http://www.magofun.com its a lot faster. You could also go to your local mall and have them do it for you. Where is the fun in that? ?